Before stepping onto the Oscar Dyson, I wasn’t quite sure about much of the science going on. Did they just put the nets in the water every so often and hope to catch some fish? Carefully lean over the side of the ship saying “here fishy fishy” with the hope that the pollock would find their way into the net? Neither of these scenarios is correct (good thing I’m not actually a fisherman!). So today’s lesson is going to be all about what the chief scientist actually uses to find fish: hydroacoustics (hydro meaning water and acoustics meaning sound). 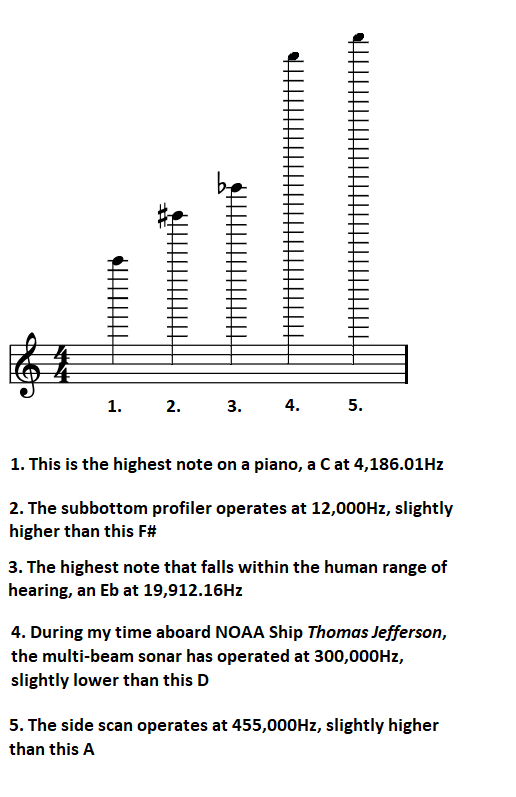 This also involves SONAR, which is short for SOund Navigation And Ranging. If you’ve ever been on a smaller boat, yacht, fishing vessel, or the like, you may have seen something called a fishfinder. The basic concepts are the same as what is happening on the Oscar Dyson. 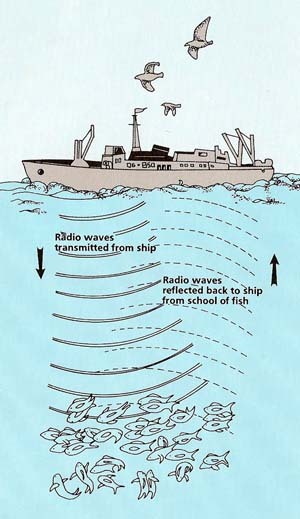 An echosounder sends a pulse of energy waves (sound) through the water. When the pulse strikes an object (such as the swim bladder in fish), it is reflected (bounced) back to the transducer. This signal is then processed and sent to some sort of visual display. Swim bladder in a fish. 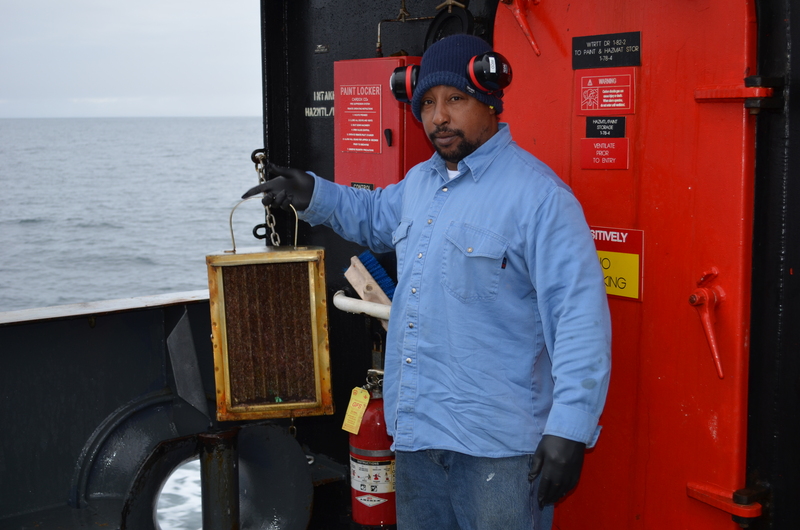 The Oscar Dyson uses acoustic quieting technology where the scientists can monitor fish populations without altering their behavior. 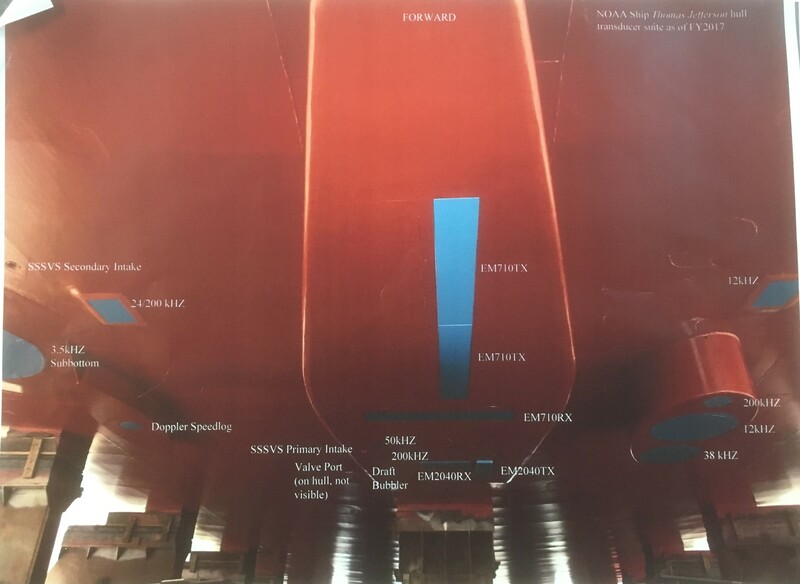 The Scientific Sonar System and various oceanographic hydrophones (underwater microphones) are raised and lowered through the water column beneath the ship on a retractable centerboard. This is important so that the transducers can be lowered away from the flow noise generated by the hull, which in turn will improve the quality of data collected. 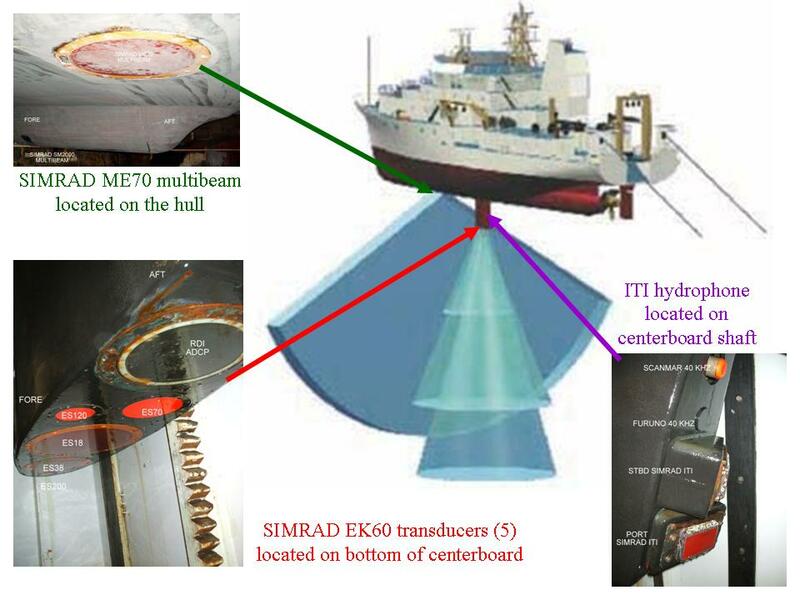 In addition, there is a multibeam sonar system located on the forward hull. 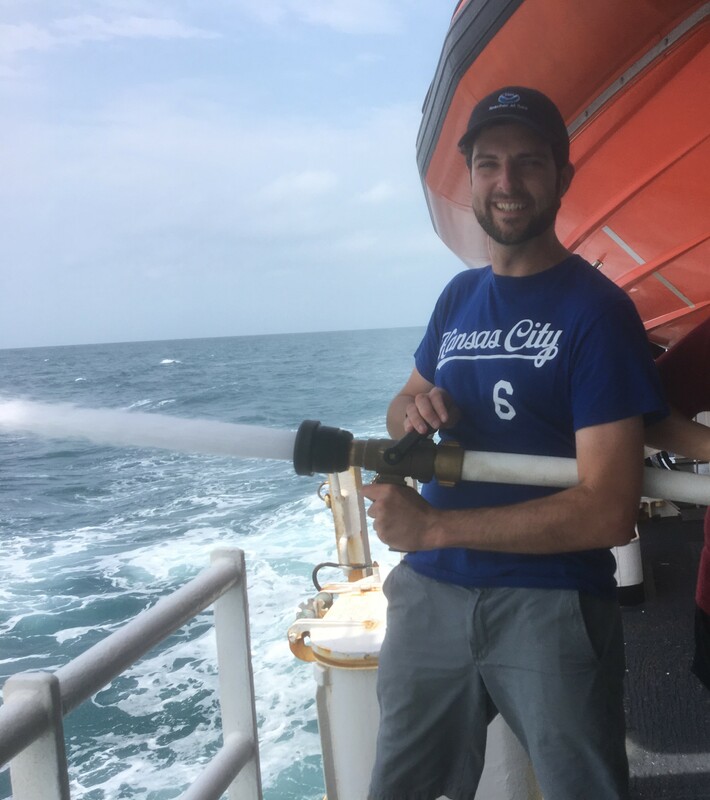 Ultimately the hydroacoustic data is all used as one piece to the puzzle of measuring the biomass of fish in the survey area. The different sonar signal transmitter/receivers (transducers) used on this leg of the pollock survey and their location on the ship. Chief scientist Neal working away in the Acoustics lab. 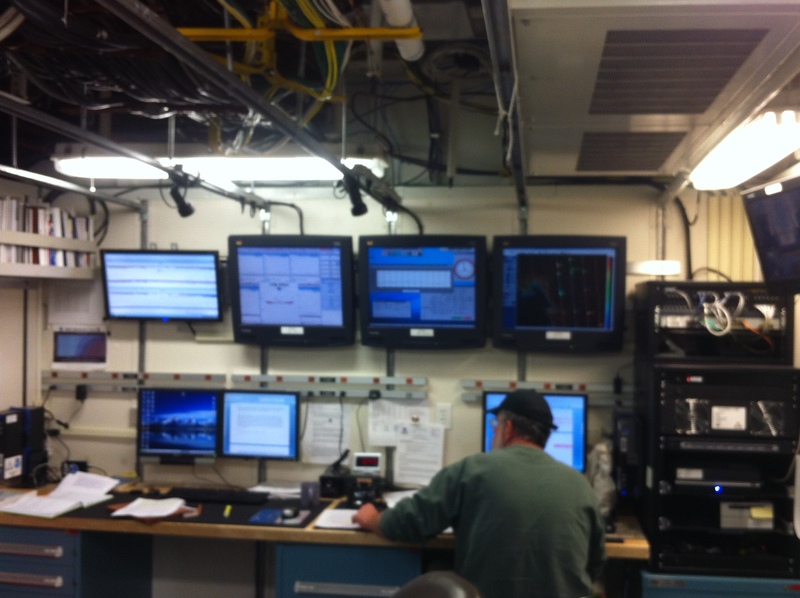 The second screen from the left on the upper row is showing the information from the ME70 multibeam. So how does this all work when we are looking for fish? 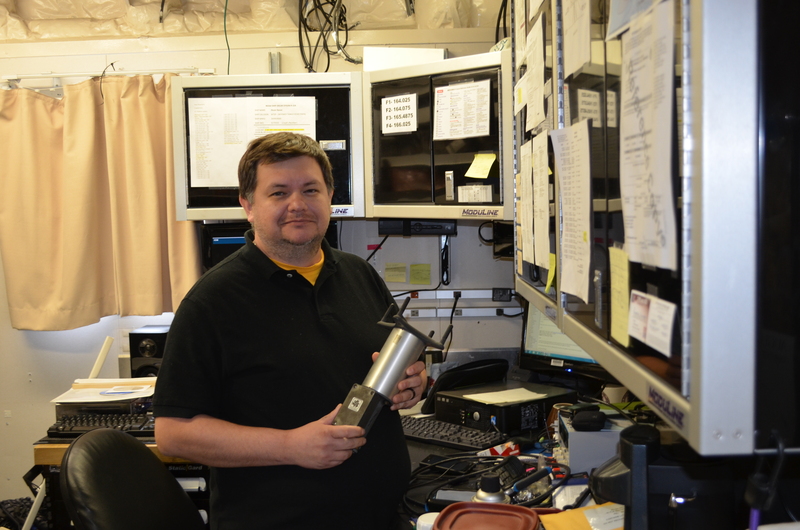 The chief scientist (Neal on the 0400-1600 watch) or another scientist (Denise on the 1600-0400 watch) will spend a lot of time analyzing the various computer screens in the acoustics lab, which has been affectionately termed the “cave” (no windows). They are looking at the information being relayed from both the multibeam and the EK60. 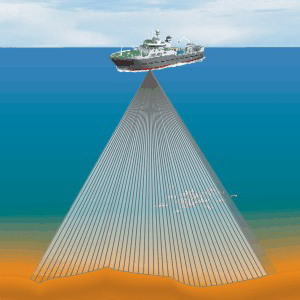 What is a multibeam? 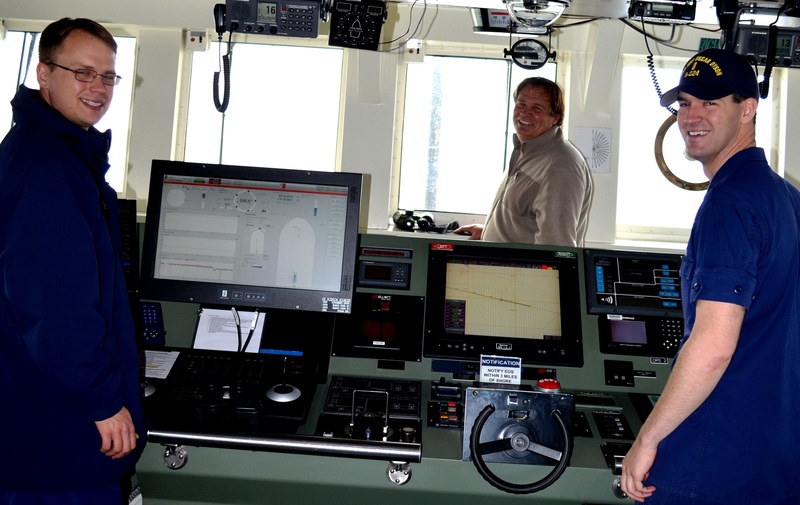 The Oscar Dyson has the Simrad ME70 scientific multibeam echosounder. It is located on the hull (underside) of the ship on the front half and sends 31 sonar beams per second down to the bottom of the sea floor. Aft of the multibeam (on the centerboard) are the five Simrad transducers. It may seem confusing, but hopefully I can walk you through a teensy little bit of how it works when we are looking to trawl for fish. 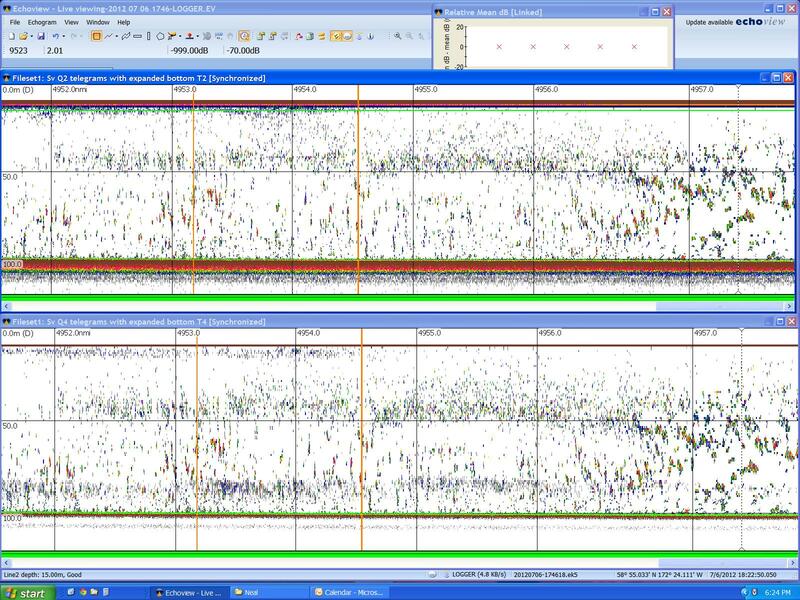 Information from the EK60 transducer at 18kHz (top) and 38kHz (bottom). Information from the EK60 echosounder is displayed on the far left screen in the acoustics lab while information for the ME70 multibeam is displayed on the next screen. The darker patches are showing that there are fish in that area. 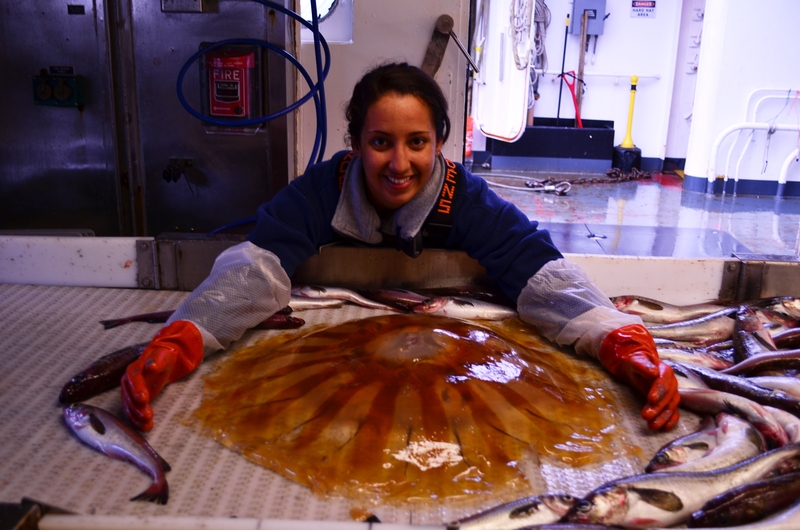 When the scientist first starts to see a good amount of fish, they will “mark” it and keep watching. 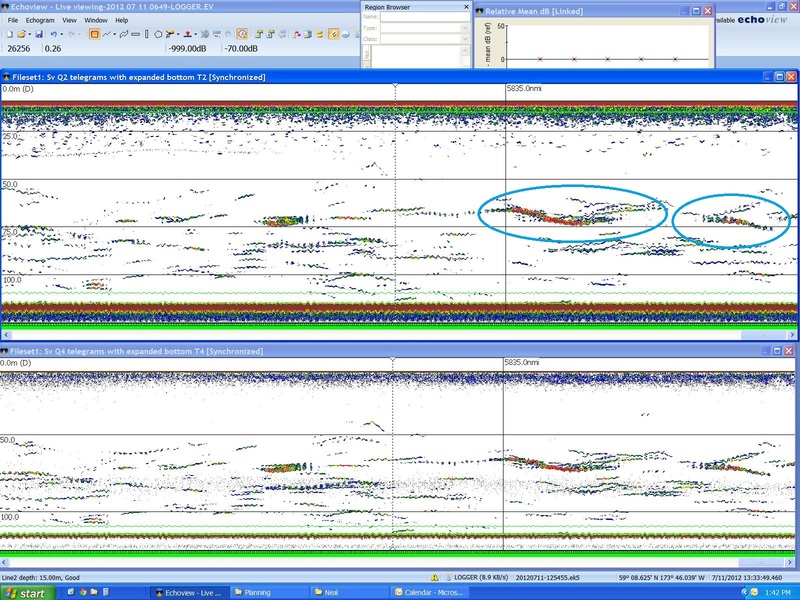 If the screen fills up with fish (as in the EK60 image), the scientist will call upstairs to the bridge and tell them where to head back to on the transect line to start trawling. Depending on the location of the fish in the water column, it may be a bottom trawl (83-112 net), a midwater trawl (AWT net), or a methot trawl. 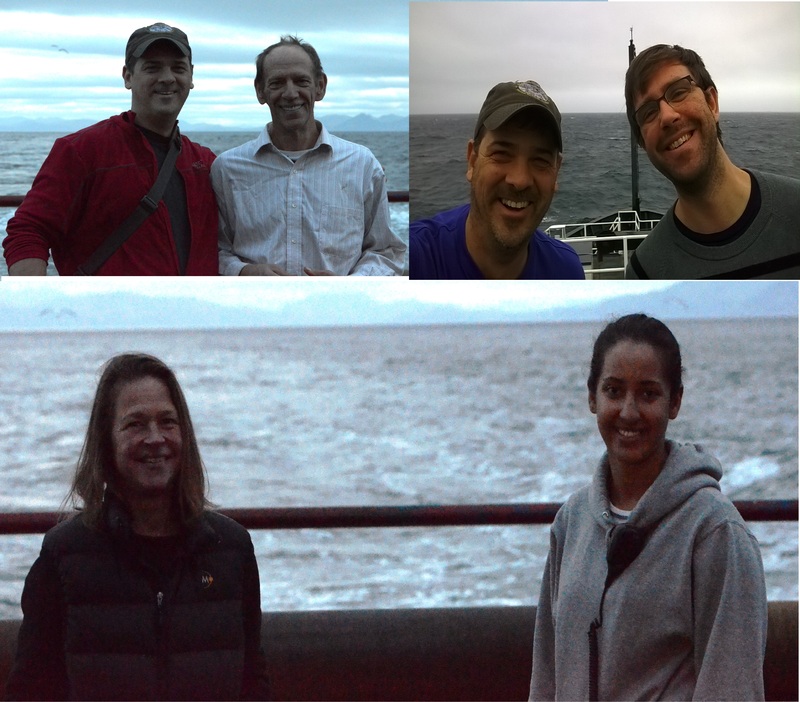 Side note: the 83-112 midwater comparison trawl that I’ve mentioned before is done almost immediately after an AWT midwater trawl to compare the fish caught in a common area. 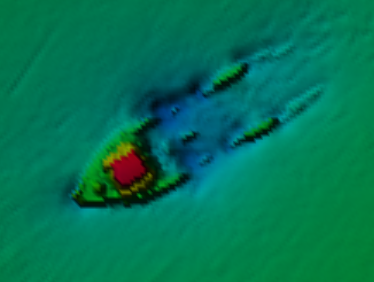 Information from the ME70 multibeam. You can determine the sea floor depth and there are five narrow beam slices from the mid-section of the multibeam (of the 31 different beams that span 120 degrees) displayed on screen. Chief scientist Neal up on the bridge. 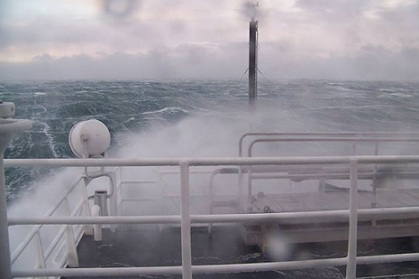 Then the scientist will head upstairs as the deck crew is preparing the net. One of the many sensors attached to the net is called the FS70 fishsounder or “the turtle”, and it is only used during trawls (because it is attached to the headrope). The scientist can “watch” the fish swimming under the ship using the EK60 information combined with the information from the fishsounder. The yellow “turtle” on the right in the image shows how the FS70 is flying in the water. You want minimal pitch and roll and for the front of it to be facing the back of the ship. This way, we can “see” the fish as they are going through the net. The officer of the deck and lead fisherman or head boatswain can adjust various things to keep the turtle in the right orientation. 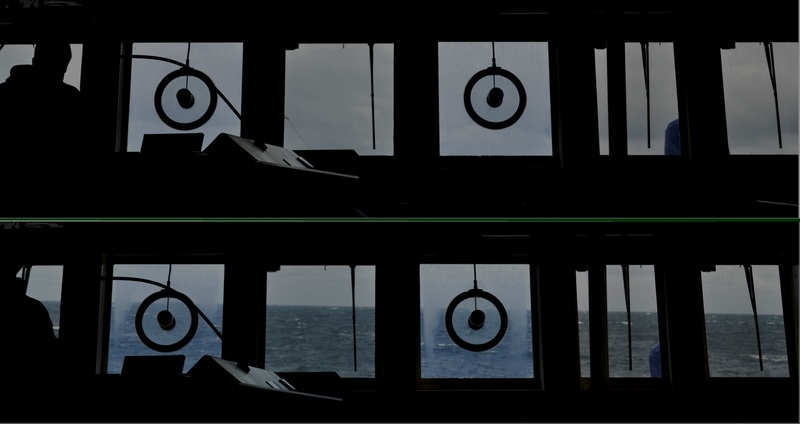 The middle image below is constantly changing on the screen in the bridge as the sonar is sweeping back and forth, so you can almost watch the individual fish enter the net. It was interesting to watch the delay between when you would see the fish from the EK60 (on the left) and when you saw them with the FS70 (middle). 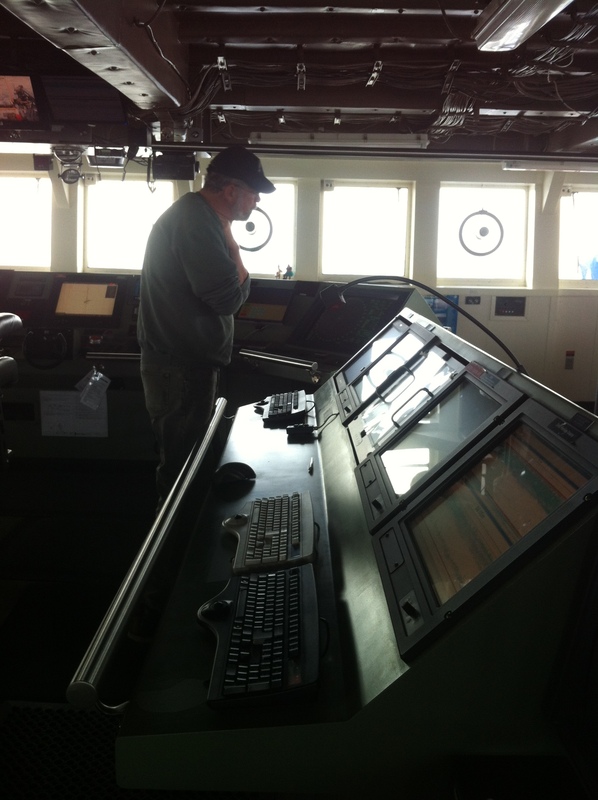 Display screens on the bridge used during a trawl. Once the scientist is satisfied that enough fish have been caught for a sufficient sample size, the net will be hauled back and the acoustics work is done for just a little bit (giving Neal some time to grab some well-deserved coffee and the rest of us time to get our rain gear on to process the fish). 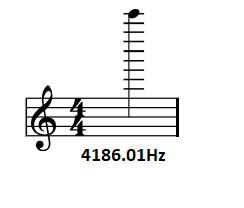 Why do we use different frequencies in the acoustic studies? This ties right back in to chemistry (and other sciences) with an equation and the relationship between frequency and wavelength (yay!). Basically there is an inverse relationship which means that at a high frequency there is a smaller or shorter wavelength (wavelength is the distance for peak to peak of a wave). 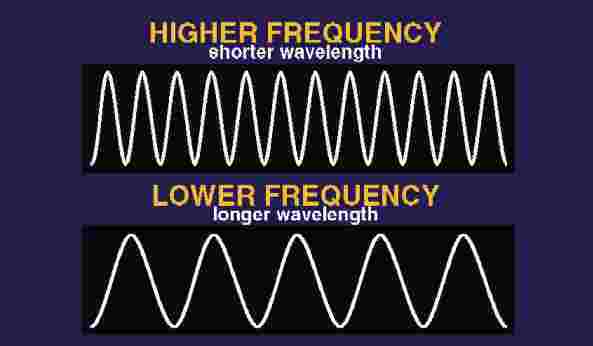 At a low frequency, there is a higher or longer wavelength. At a low frequency, you will see only see things that are larger, like pollock, whereas you will see very small things like krill and zooplankton at higher frequencies. Having information from both types of frequencies is necessary to complete the scientific research on the Oscar Dyson. Traveling at 1 knot, showing single fish from EK60 sonar. Is it possible to see a single fish? Yes! From sunset to sunrise, the Oscar Dyson doesn’t actually travel the transect lines. This is because the pollock behave differently during darkness than during the day. So instead of traveling between 11 and 12 knots (which is what happens between trawls), it’s almost like the boat is just sitting around for a couple of hours. But during this time, since the boat isn’t moving along quickly, it’s possibly to see individual fish on the sonar as shown in the image. 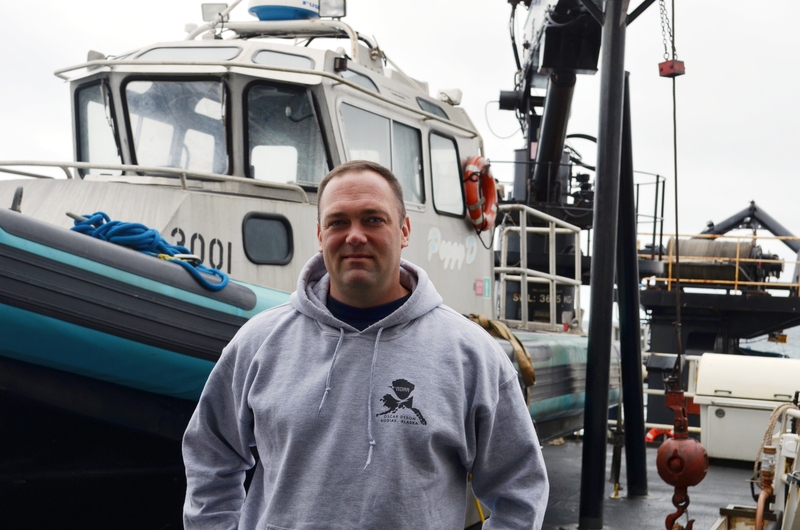 Today is Friday the 13th but it was far from unlucky – I finally saw something out in the water other than fog: a boat! Again, all good sightings seem to come from up on the bridge, so I’m thankful for Lieutenant Matt for allowing me to ask a billion questions while I’m up there and teaching me more than I ever thought my brain could hold. He has all of the qualities of a great teacher, which is nice to see. The ship we saw up on the bridge this morning from about 5 nautical miles away (left), on the sonar (middle), and through the binoculars (right). Neal and I dancing while waiting for the fish! Highlight from the other day? 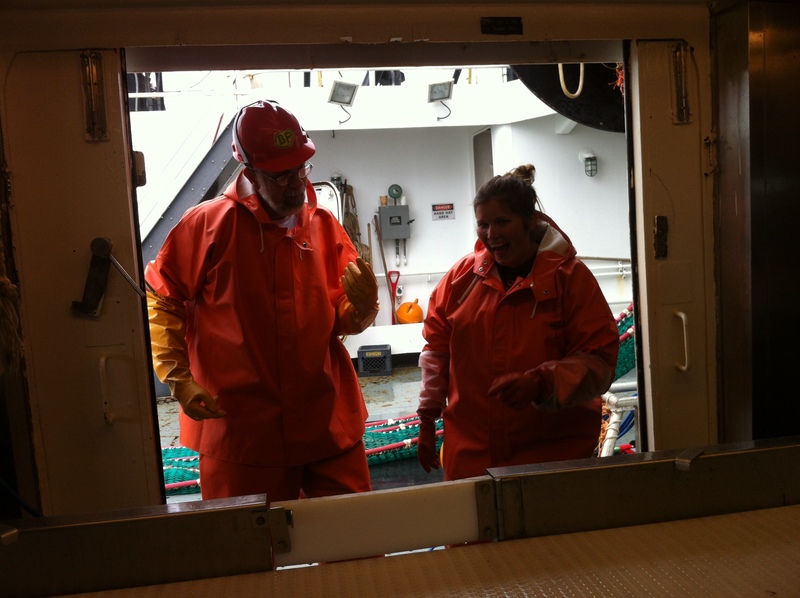 Chief scientist Neal finally dressed out in his Grundens (rain gear) and came to help process a catch in the fish lab! While waiting, he even took a quick second to dance in the doorway (we were “Dougie”-ing) to my music that was playing over the speaker system.